평균연령의 증가와 서울로 유입된 인구의 정착으로 65세 이상의 노년 인구비율은 지속적으로 증가하고 있다. 2000년 서울의 노인 인구비율은 6%로 1980년 3%에서 20여년간 두배로 증가하였다. 노년층 인구의 증가는 서울시 전역에 확대되고 있으며, 확대하는 과정은 서울의 지역 개발과정과 일치하여 지역개발이 완료된 지역일수록 노년 인구비율이 높게 나타나고 있다. Due to an increase of mean age and population influx into Seoul, the elderly over 65 continues to grow. Population ratio of the elderly stood at 3% in 1980, however it increased to 6% in 2000, doubled over a period of 20 years. 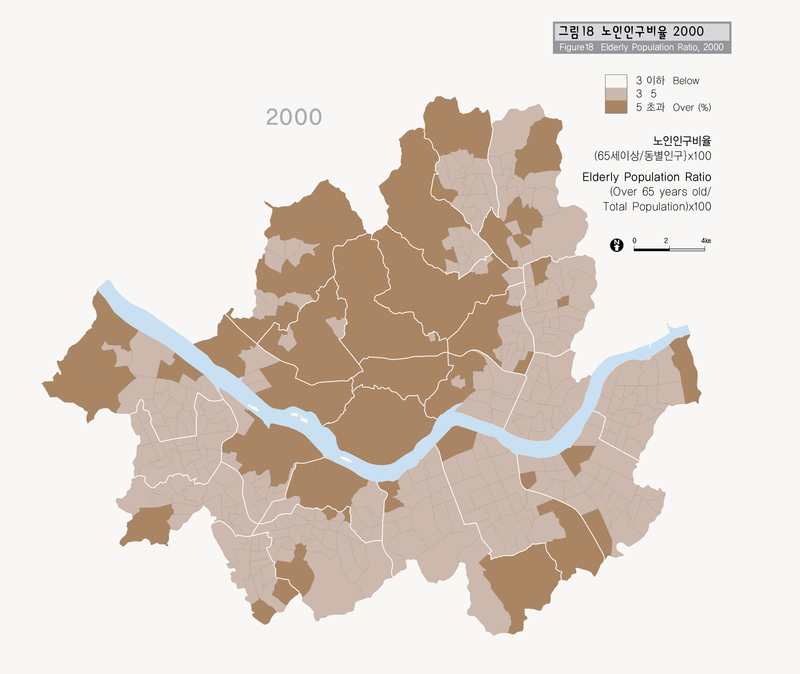 The elderly population increase keeps expanding throughout Seoul and it corresponds to regional developments of Seoul. The area where regional development is complete tends to show higher elderly populations.